Naturally Happy Dogs Blog: Book review: My dog is deaf – but lives life to the full! Book review: My dog is deaf – but lives life to the full! This book is written from the perspective of someone living outside of the United Kingdom so some of the material would not apply here but this is a wonderful book. I have helped people with deaf dogs for the last few years. This is a book I would recommend to any deaf dog owner. Jennifer has done an excellent job. The author presented the information in a manner that was both informative and fun to read, she also explained how living with a deaf dog isn’t as big a deal as people make out. The author speaks to us all in a language we understand. Jennifer continues on to cover how you can train your deaf dog and how to teach signs to deaf dogs. She then covers common hurdles you may face and how to overcome them. 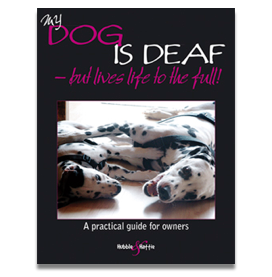 The thing I liked most about this book is that everyone would benefit from reading it, whether you are a very experienced deaf dog owner or brand new to it, these books will both explain and reassure you that these things aren’t that scary and puts your mind at ease. This book has got 5 stars from me and I will definitely recommend this to any clients and friends of mine.